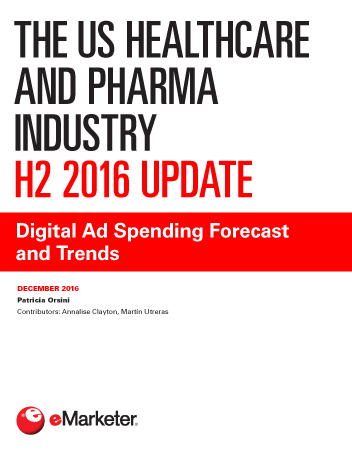 US healthcare and pharma advertisers will spend $2.02 billion on digital advertising in 2016, a 20.5% gain from 2015. The sector will account for 2.8% of total US digital ad spending for the year. The diabetes drug market has seen increased spending overall in 2016, with competition among drug makers particularly fierce this year as new entrants from Boehringer Ingelheim (BI), Sanofi and Eli Lilly crowd the field. At the same time, ad spending for established medications from AstraZeneca, Johnson & Johnson and others was more than enough to hold their ground. Patient education is one area that advertisers are focusing on. While TV still receives the bulk of such spending, digital channels are accustomed to feeding information to patients who need help adhering to their medication regimens. BI said in June that it planned to use gamification to provide support to patients taking its diabetes drug Jardiance. This tactic had been used previously for another medication, Spiriva Respimat. That campaign provided education about the drug, and gave patients points for taking their medication. The points could then be exchanged for rewards such as gift cards. Multiple sclerosis drugs are another crowded marketplace where brands are using digital to create brand awareness. Sanofi has been using actress Madeleine Stowe as a spokesperson for Aubagio, most recently in a series of web interviews in which she spoke to patients, nurses and physical therapists offering advice for MS patients and their caregivers. An ongoing social media campaign from Novartis for Gilenya featured patients sharing tips on how they manage their condition. Education was the focus of a digital campaign from Bristol-Myers Squibb in September about immuno-oncology drugs. The drugs, which are used in place of traditional chemotherapy and radiation treatments, are a fairly new form of treatment. “On our I-O discovery website, there’s a graphic comparing a garden to immuno-oncology. We’re trying to break it down in a way that people can get the aha moment in their head,” Carrie Fernandez, head of US communications for Bristol-Myers Squibb, told Medical Marketing & Media. "The digital ad spending predictions for the US healthcare and pharma industry in this report are upward revisions from eMarketer’s March 2016 forecast. Previously, spending in this sector was projected to total $1.93 billion for 2016. Increases in spending on digital video and social media adverting, with a focus on mobile, are factors in the forecast update. Spending will continue to increase through 2020, when healthcare and pharma brands will spend $3.34 billion on digital advertising."